The Turkish government on Monday demanded the US-led coalition to provide air support to Turkey-backed rebel groups in their fight against ISIS near the Syrian northern city of al-Bab. The Islamic State (ISIS) militant group is in control of the city of al-Bab north of Aleppo Governorate. 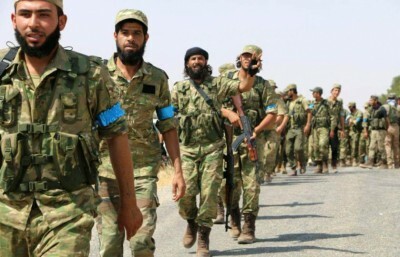 Turkey’s military and allied rebels of the Euphrates Shield Brigades advanced towards al-Bab after taking the nearby city of Jarablus last August. The US-led coalition is mainly supporting the Kurdish-led Syrian Democratic Forces (SDF) in the fight against ISIS in northern Syria. The SDF has expelled ISIS from main cities and towns in Hasakah Governorate, Kobane and Manbij, and they are currently combatting ISIS in Raqqa–the group’s de facto capital. “The international coalition must carry out its duties regarding aerial support to the battle we are fighting in al-Bab. Not giving the necessary support is unacceptable,” President Tayyip Erdogan’s spokesman, Ibrahim Kalin, told a news conference on Monday. On August 24, the Turkish Army and allied rebels in Syria launched the so-called Euphrates Shield Operations. On the same day, Turkey announced the “liberation” of Jarablus city from ISIS. However, according to local activists, the Turkish army forces and allied rebel groups have taken Jarablus without any resistance from ISIS. Subsequent to the Turkish advance in Jarablus, clashes erupted between the US-backed Syrian Democratic Forces and the pro-Turkey factions. The US-led coalition has not previously, and is not now supporting the Syrian rebels’ push into al-Bab city, according to its spokesman. “The coalition has not been a part of the Turkish advance toward al-Bab. This is a national decision that they made,” Colonel John Dorrian, an Operation Inherent Resolve spokesman, said in mid-November. According to Col Dorrian, the coalition’s advisors are not part of the al-Bab operation. “[Our] advisors were removed after the Turkey-backed rebels started moving on al-Bab,” he said. “We’ve not supported the advance to al-Bab thus far. We did conduct a lot of strikes in support of the Turkish military and their partnered force as they conducted operations to clear Daesh along their border,” Col Dorrian explained, in reference to earlier Turkish Army operations near the towns of Jarabulus and Marea. The American colonel also said that operations against the Islamic State (ISIS) by both Turkey-backed rebels and the Kurdish-led Syrian Democratic Forces (SDF) should be coordinated. “We believe that all of the operations in Syria against Daesh should be coordinated, very closely, between all the parties that are involved,” Col Dorrian said. According to the coalition’s spokesman, deconfliction measures are in place to prevent the SDF and rebel forces from “converging in a way that would be unhelpful.” Analysts believe that there is a potential for clashes between Turkey-aligned rebel groups and the SDF as both want to take al-Bab city. While Kurdish-led forces want to secure the city in order connect the Afrin and Kobane canton administrations, Turkey’s main goal in northern Syrian is to prevent Kurdish contiguity. Their objectives are irreconcilable.